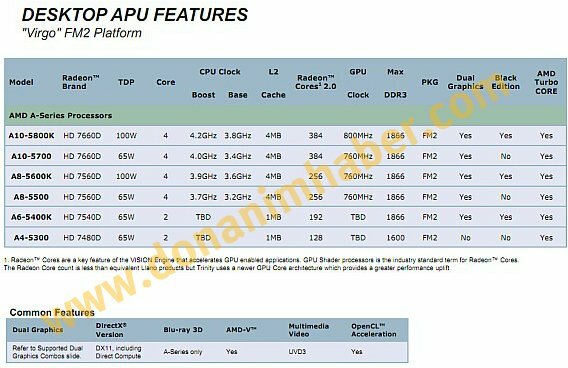 TechPowerUp found details about six upcoming AMD Trinity APUs, you can check it out over here. An interesting revelation here is that AMD does not have triple-core APUs anywhere in its lineup. The A10 lineup consists of quad-core APUs that come with Radeon HD 7660D graphics, while the A8 lineup also consists of quad-core APUs, but with slower Radeon HD 7560D graphics. The A6 lineup consists of dual-core APUs with Radeon HD 7540D graphics, while the A4 lineup has dual-core APUs with Radeon HD 7480D graphics. The HD 7660D has 384 Graphics CoreNext stream processors, HD 7560D has 256 of these, the HD 7540D has 192, and the HD 7480D has 128. The HD 7480D also lacks dual-graphics support that lets you pair the APU-embedded graphics processor with a compatible discrete GPU to make the two work in tandem. While these GPUs have comparatively lower stream processors than previous-generation "Llano", performance increase is made up for by the more advanced GPU architecture, and higher GPU core speeds.